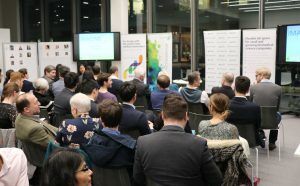 There was a full house at the Oxford Bioescalator on February 27th for the IMAGINE IF! Oxford Final with an inspiring atmosphere dominated by the hustle and bustle of Oxford academic, creative, and entrepreneurial community. 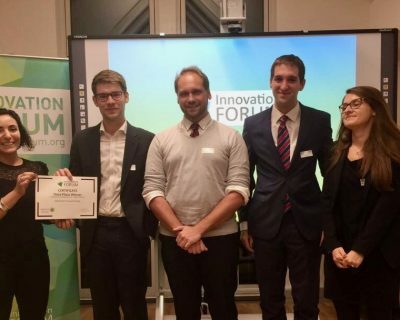 The Oxford Neuro Technologies team convinced the panel of judges and won the local pitching competition. The founder of Oxford Neuro Technologies, Ellis Parry, shared the story of his twin brother Luke who has severe brain injury and has inspired the start-up team to address the rehabilitation challenges that face patients like Luke. The team’s smartphone app brings technology into the everyday routine of users who have experienced a stroke or severe head injury and helps aid memory recall and reduce anxiety. The runner-up on the night was Adelie Health. The Adelie Health team have developed PenPal, a smart device that connects to the cap of an insulin pen and helps diabetics manage their condition by monitoring dosing via a smartphone app. The clean-tech section in the competition was represented by Spectre Bio who won the third place. The Spectre Bio team created a portable pollution sensor named Spectre. The pitch from Spectre Bio team impressed the judges with the capabilities of their innovative platform that can measure pollutants in and outside the body with a pill-sized sensor. As local winners, Oxford Neuro Technologies will now be offered the opportunity to work with our supporters the Oxford BioEscalator and the Oxford Trust for six-months, occupying desk or lab space in each location. The Oxford BioEscalator has offered much-needed physical lab space for life sciences startups in Oxford since opening in September 2018. As our principle IMAGINE IF! pre-accelerator sponsor the Bioescalator generously hosted the pitch event; continuing to act as a brilliant catalyst for life science innovation in Oxford. 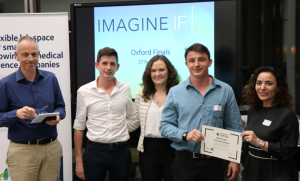 The Oxford Trust, a well-established local charity that has pioneered the support for innovation and entrepreneurship since its establishment in 1985, provides the perfect complement to the BioEscalator’s support, securing space and continued mentorship to more IMAGINE IF! Oxford finalists. Our heartfelt gratitude goes to the IMAGINE IF! Oxford mentors whose guidance in bespoke one-on-one sessions with the Oxford finalists propelled them to a pitch-ready state. With their wide-ranging expertise in life science and medtech industry, investment, intellectual property, innovation and entrepreneurship, our mentors have imparted invaluable advice and guidance for the early-stage startups. This bespoke support has clearly increased each startup’s chances of secure funding and the opportunity to fulfil their potential by turning their science into a real-life commercial solution. 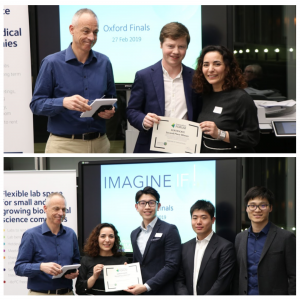 For Oxford winner Oxford Neuro Technologies the journey with IMAGINE IF! continues. The start-up is going to pitch again in the Global IMAGINE IF! Final against the other finalists from Europe and worldwide. The global prize is a non-dilutive £10,000 cash prize, crowdfunding campaign, six-months lab space, and mentoring by world-leading experts. The Global IMAGINE IF! Final takes place at the Health Horizons Conference, an international healthcare summit, in Cambridge from 26th to 27th June 2019. Read more about Health Horizons Future Healthcare Conference here.